Elizabeth Magill (b. 1959, Canada) lives and works in London. Magill's paintings are characterised by a rich palette and intense layered brush marks. They begin with layers of thinned paint being applied to the canvas - these random fluid elements create the visual backdrop out of which her paintings emerge. The studied and precise observations, which provide the foundation to the artist's work, are countered with impulsive or wilful gesture, the haze of memory and nostalgia is overlaid with bursts of harsh clarity. 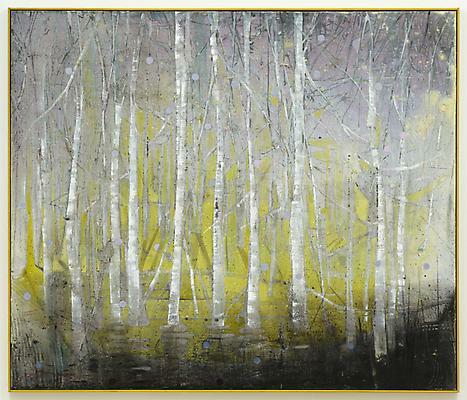 Important solo exhibitions include Green Light Wanes at Towner Gallery, Eastbourne, UK (2011); Elizabeth Magill at Ikon Gallery, Birmingham, UK; Milton Keynes Gallery, UK; BALTIC, Gateshead, UK (2004-5); Hugh Lane Gallery, Dublin (2003) and Southampton City Art Gallery, Southampton, UK (1999). Recent group exhibitions include Double Interview at Artspace, Seoul (2011); Interlude at Douglas Hyde Gallery, Dublin (2011). Her work is in numerous public collections including Arts Council of Great Britain, Arts Council of Northern Ireland, British Council, Deutsche Bank, Dublin City Gallery, The Government Art Collection, The Hugh Lane, Irish Museum of Modern Art, National Gallery of Australia, Neuberger Berman Collection, USA, Southampton City Art Gallery, Towner Art Gallery and Museum, and Ulster Museum. There is an exhibition of Magill's new paintings at Wilkinson Gallery, London, running until 30 June 2013. Godfrey Worsdale began his curatorial career in the early 1990s at the British Museum and established Cultural Instructions; an independent gallery in London. He moved to Southampton City Art Gallery as Curator in 1995, and was appointed Director in 1998. In 2002 he became Founding Director of Middlesbrough Institute of Modern Art and in 2008 he was appointed Director of BALTIC Centre for Contemporary Art. He joined the judging panels of the Zoo Art Fair in 2007 and the Paul Hamlyn Awards in 2008. He was a selector for the British Pavilion for the 2011 Venice Biennale and a judge for the 2011 Turner Prize. He is the Chairman of the UK's Visual Art and Galleries Association, Chairman of the National Contemporary Visual Arts Network, a Patron of the Crisis Commission, a Trustee of the Northern Canon Art Collection and a Fellow of the Royal Society of Arts.